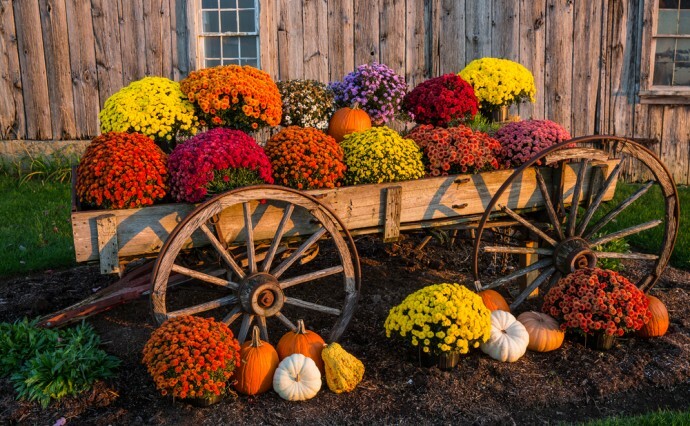 Adding Color to Your Fall Landscape | Done Right Landscape and Construction Company Inc.
As the cooler months are rolling in, the days are getting shorter, the skies are becoming gloomier, and our landscapes are starting to become dull. While we can’t control the temperatures or make the days longer, but we can brighten up our Fall season by adding some color to our garden. Sprucing up your landscape with a combination of trees, shrubs and plants turn a boring yard into a thriving one full of texture and dimension. Adding a variety of blooming plants to your garden that will survive well into the Fall months is essential. Snapdragons, Marigolds, salvia and silver dusters are a few options for annuals that provide color and flourish through the Fall. These three often look best when planted in rows or large groupings. Since they don’t grow too tall, they can even be used a border around your garden bed for a pop of color. For these plants to successfully bloom, it’s best to have them planted before Fall has completely arrived. This gives the plants a chance to establish themselves before the temperatures start to rapidly drop. Mums and asters are also flowering favorites that thrive in the Fall. Because they grow somewhat bushy, these are typically planted in clusters where large spaces need to be filled. Aside from flowering plants, there are other types of plants that can be included in your garden to add colorful focal points. Planting bushes and shrubs that have a colorful display of leaves or fruit and berries are a good choice. Lining up several Cotoneasters can create a colorful hedge in your yard. Burning bushes are another popular choice, as their vibrant red coloring typically remains until the first snow. Cranberry shrubs, the Canada Red Select Cherry can be used as ornamentals, adding fruit and color to your yard. Using any combination of these shrubs will add interesting texture and appeal to your garden throughout the Fall season. To learn more about how you can enhance the look of your Fall landscape, contact the experts at Done Right Landscape. Fill out a contact form or give us a call at 781-858-8000.